We did it again! Artistic Stone Design was awarded Angie’s List Super Service Award for the third year in a row. But, this year we did it bigger and better. 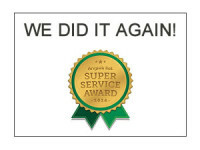 We actually won 2 Super Service Awards. We won the first one in the countertop category and we won the second award in the Marble and Granite category. Now for those of you that don’t know, Angie’s List has a very strict criteria for winning these awards. Only about 5% of Angie’s List companies qualify for the award. Artistic Stone Design works very hard throughout the year to make sure that we qualify for it and again we must thank our customers that work with us and give us such great reviews. We appreciate you and your support.